Hollins paddlers battled Sweet Briar last October and won the American Canoe Association Collegiate Race Series Virginia Championship. The race took place on a section of the Rappahannock River that includes a class III rapid, which the students braved in sub-forty-degree temperatures. 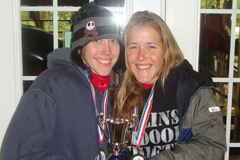 Seniors Mia McDonald and Tina DelPup won the gold medal for tandem canoeing.